I wonder, is it a coincidence that computers achieved their dominance at just the moment that life on earth became so cataclysmically imperilled? I wonder if that was a driver, if part of the urge to escape feeling, to plug the need for contact with the drug of perpetual attention, comes from the anxiety that we will one day be the last ones left, the last species surviving on this multifarious, flowered planet, drifting through empty space. That's the nightmare, isn't it, to be abandoned in perpetuity? Robinson Crusoe on his island, Frankenstein's monster disappearing on to the ice, Solaris, Gravity, Alien, a weeping Will Smith in I am Legend wandering the desolate, unpeopled, post-plague city of New York, begging a mannequin in an abandoned video store to please say hello to me, please say hello to me: all these horror stories revolve around the terror of solitude without the prospect of cure, loneliness without the hope of alleviation or redemption. ﻿It had no name, only a number assigned by a rip-and-run survey team before the rise and fall of the two empires, and it was old, about twice the age of Earth. The tectonic plates of its lithosphere had set in place after its outer core had cooled and solidified; any mountains it might once have possessed had long ago weathered to dust; after its magnetosphere had decayed most of its original atmosphere had been blown away by the solar wind of its star. It had been cold and virtually airless when the so-called Old Old Ones, said by some to have been the first of the Jackaroo’s clients, said by others to have been the Jackaroo’s precursors, had arrived, thickening its atmosphere and rebooting its hydrological cycle by bombarding the vast ice-cap on the dark side with comets diverted from the red dwarf’s threadbare Oort cloud. Now the slime planet was cloaked in a reducing atmosphere of nitrogen, methane and ammonia, and a shallow sea turbid with ferrous iron spread across its substellar hemisphere, broken by a single sodden land-mass near the terminator between light and darkness. Enormous rafts of sticky foam generated by blooms of photosynthetic bacteria floated everywhere on the sea, and colonies of stromatolites grew in a few muddy bays on the sunward edge of the lone continent. Those colonies were what had brought Tony Okoye and the crew of wizards here, in a three-way partnership with the broker on Dry Salvages who had purchased the old survey team’s report. Unprepossessing mounds like melted candle stumps, built from layers of sediments and bacterial filaments and slime, the stromatolites contained nodes of archival genetic material and communicated with each other via a wide-bandwidth transmission system constructed from arrays of microscopic magnetic crystals. The chief wizard, Fred Firat, believed that they were the remnants of a planetary intelligence, a noosphere woven from algorithms that were the common ancestors of the various species found in active artefacts left by the Elder Cultures. A root kit or Rosetta stone that would unlock all kinds of secrets, including the causes of sleepy sickness, Smythe’s Syndrome, counting disorder, and other meme plagues. Fred Firat had the grandstanding rhetoric and unblinking gaze of someone who carried the fire of true crazed genius, and like all the best salesmen, prophets and charlatans he was his first and best convert to his cause. He was convinced that the scant data buried in the records of that old expedition pointed towards something of fundamental importance, had sold the idea to Ayo and Aunty Jael during a virtuoso performance via q-phone. Which was how Tony had found himself embarked on what might be the biggest score of his freebooter career. A couple of decades ago, back when I was a scientist as well as a science-fiction writer, I worked on plant-animal symbioses. 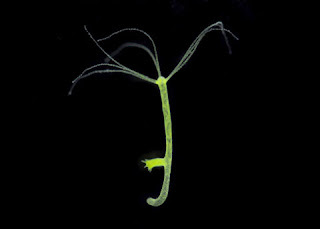 My lab spirit animal was the humble green hydra, a freshwater relative of jellyfish, sea anemones and corals. Green hydra are relatively easy to grow. So long as they are fed and kept at a constant temperature, they reproduce, like the one in the picture below, by budding off copies of themselves. You can quite quickly fill glass trays with thousands of cloned hydra derived from a single parent. Like certain of their marine relatives, green hydra possess a population of symbiotic algae: an average of twenty or so green single-celled Chlorella lodged in vacuoles inside each of the digestive cells of the hydra's endoderm, like individually-wrapped apples in supermarket baskets. The Chlorella release to their host about half of the carbon they fix by photosynthesis, in the form of the simple sugar maltose; the hydra supplies nitrogen and phosphate. But as far as the hydra is concerned, it is not an obligate relationship. If you expose green hydra to intense light in the presence of the herbicide DCMU, which specifically disrupts the chain of reactions by which photosynthesis converts light energy to chemical energy, the Chlorella cells are internally poisoned and, dead or dying, are expelled by their hosts. The hydra are, to use the term coined by the inventor of this method, bleached. Turned into algae-free albinos that provide useful controls for experiment that probe the symbiotic relationship. Maybe you can see where I'm going with this. Currently, reef corals in the Great Barrier Reef and elsewhere around the world are bleaching. Spitting out symbiotic algae (brown zooxanthellae rather than green Chlorella) whose photosynthetic capabilities have been adversely affected by a rise in sea temperature above the normal seasonal maximum. It's the third mass global bleaching event in less than two decades (the first, the first ever, was observed in 1998; the second in 2010). Unlike green hydra in the laboratory, reef corals need their symbionts to survive. Some corals can recover, reacquiring zooxanthellae from the environment or from remnant populations in their tissues. The rest die. In the areas of the Great Barrier Reef affected by this bleaching event, about 50% of the reef corals are expected to be lost. It's a signal event in global warming. It shows us that the effects of human activity can reach inside the cells of reef corals, reach into the chloroplasts of their symbiotic algae, and disrupt their normal activity. A vast uncontrolled experiment, with no planning or endpoint, in the only biosphere we possess; the biosphere we must also inhabit. There are no controls.